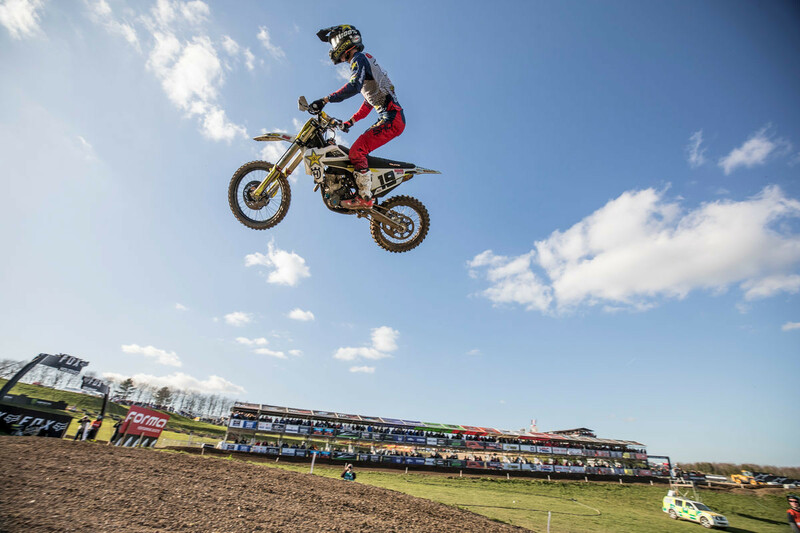 While the March climate in Britain can best be described as a stormy mess of potential havoc, tranquil calm and arrived on a key date in the UK diary for motocross fans. For the second year in a row Matterley Basin was coated with southern English sunshine but this time the scheduling was chancy: the second round of 19 in MXGP—the first in Europe—took place toward the end of March. Never the most reliable period for English weather. A similar time slot 12 months ago for the Grand Prix of Europe in the Netherlands (scene of round three this weekend and only a few hundred miles east) saw MXGP hit by a snowstorm and near-sub zero temperatures. Matterley survived the odds and thrived with a very generous turnout of public on Sunday. Here are some of the standout moments and achievements from a fixture that missed both reigning champions in action for the first time since the 2016 Grand Prix of Lombardia. 1. 87, but who’s counting? 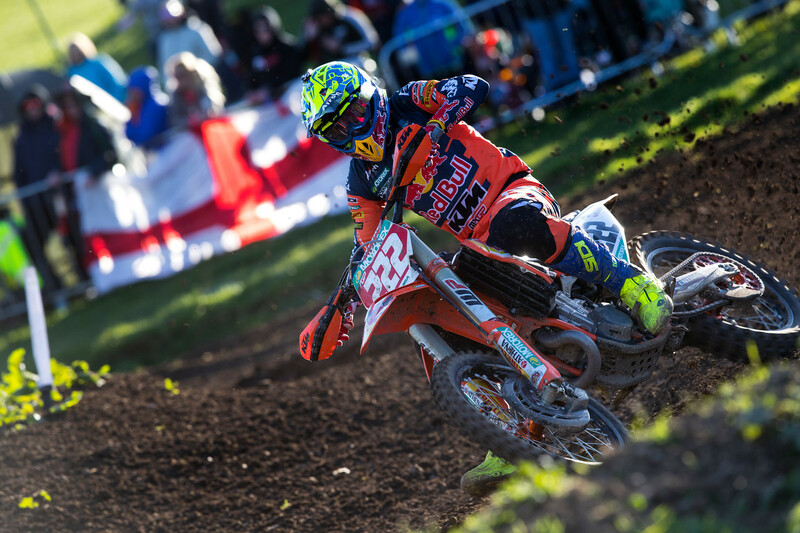 Red Bull KTM’s Antonio Cairoli won his first premier class Grand Prix at Matterley Basin since 2011 with a 2-1. Yesterday he scored his second victory of the season (and his fifth at the English course where he previously celebrated title success) with a 1-2 and a demonstration of conservative and percentage riding. He warmed-up from a stiff right shoulder that he carried into the event and remained on two wheels while closest threat, Honda HRC’s Tim Gajser, was extremely lucky to escape unhurt from a first moto crash while leading. Matterley was in prime condition but the rough parts and the square-edges did not make for an inviting mix with the high speed and big jumps and there was a discernible absence of notable risk-taking. Cairoli showed exactly the mettle that has led to nine world championships: effective starts, excellent assessment, and race craft. In fact, his last lap tumble while winning the Qualification Heat on Saturday seemed very out of character (as usual Cairoli kept any physical disadvantage he was carrying very close to his chest). There were spurs of action but the motos were quite formulaic and the respect paid to the racetrack can be seen in the 54 second gap back to Gautier Paulin in third place (the Frenchman taking his first podium finish with the Monster Energy Wilvo Yamaha). Another 54 seconds covered the riders down to 16th in the second moto, revealing just how much Cairoli and Gajser had controlled the 30 minutes and 2 laps. The championship leader even rallied hard in the last two circulations and was less than two seconds behind the Honda at the finish. No Herlings, no Febvre, and more crashes for the likes of Monster Energy Kawasaki’s Clement Desalle (the Belgian doing well to finish fourth, even with a swollen left hand) means that Cairoli is making hay in the formative stages of MXGP 2019 but Gajser’s presence remains ominous if he can match Cairoli’s measured approach. Rockstar Energy Husqvarna’s Thomas Kjer Olsen enforced his billing as Jorge Prado’s principal title threat this season by convincingly winning his third Grand Prix (one for each season in MX2 now) and admitting his delight in hoisting the red plate for the first time. The Dane was untouchable in England despite the best efforts of F&H Kawasaki’s Henry Jacobi (the German describing his “professional” winter as a “next level gain” in terms of his riding and preparation) and Red Bull KTM’s Tom Vialle. Olsen was the headline-maker and deservedly so—he was one of the very few still confident enough to hit the uphill triple on his FC 250 deep into the second MX2 moto—but he only just shaded the effort by Vialle. A factory KTM on the MX2 podium is no a strange occurrence, after all Prado and Pauls Jonass did it 29 times last year, but this was just Vialle’s second grand prix. Only 18 years old and with the knowledge of Joel Smets in his corner, Vialle is bringing some very favourable ingredients to the table: he has three from the four holeshots already in 2019, is slight and technically proficient. He led both races here but clearly still lacks some physicality and experience to match opponents like Olsen, Jacobi, and riders like Ben Watson and Calvin Vlaanderen. Last winter Vialle’s elevation into the most successful Grand Prix team in the last decade raised plenty of eyebrows but the KTM race management have proved once more that they are no mugs at this game. What frustration for Bike it DRT Kawasaki’s Darian Sanayei. The American used the force of the Steve Dixon-powered KX250 (the guy can clearly build a bike when he’s not trying to run a British Grand Prix) to lead the qualification heat on Saturday but his recent case of the Epstein-Barr virus meant that he could not capitalise on the brief show of speed. Sanayei has previous good form at Matterley, having won in the EMX250 division, and it was dispiriting to see him circulating outside of the points. Darian cannot train due to his condition, and that is having another debilitating effect on his riding. He lies in a dammed if you do, dammed if you don't predicament that will sadly only be rectified with patience. Sanayei ages out of MX2 this year. Australian sensation Mitchell Evans, of 114 Motorsports, crashed and had to pit on the first lap of the opening MX2 moto and made it to eighth place in the second, thus ending any chance of a dream second tread of the box after his debut trophy in Argentina. Rockstar Energy Husqvarna’s Jed Beaton and Revo Husqvarna’s Dylan Walsh ensured more Antipodean presence in the top ten as news emerged that Youthstream are in discussions to take MXGP to Australia for 2020. Despite the eager public announcement/interview by the promoter that talked of a three-year contract and a date as the second Grand Prix on the calendar (with a track constructed in a horse racing stadium in the west coast city of Perth) Youthstream said that the talks are “serious” but far from confirmed. The FIM Motocross World Championship has not been staged in Australia since the 2001 Grand Prix at Broadford near Melbourne. Where did Grant's picks land this weekend? There were lots of choices after things got weird in Seattle. Works Connection is now offering an affordable option for customizing its front brake and clutch caps with your rider number.